Our facility includes a 10 lane 20 yard indoor shooting range which can be rented by the hour. Private parties, birthday parties, social gatherings/group packages, corporate events are available. In fall, winter, and spring, we run indoor archery leagues. We also offer bow rental for beginners. Call now to sign up for Tournaments, Classes, and Leagues. All shooters must sign a liability waiver before shooting. Range members need to sign in and get a lane assignment before shooting. Non-members need to pay and get a lane assignment before shooting. Intoxicated use of bows and arrows on the range is prohibited. No alcoholic beverages are allowed on the range. Only shoot at designated targets. Always be aware of the target and what is beyond the target. Always draw bow with the arrow parallel to the ground. Only nock arrows at the shooting line. Always have an arrow knocked when drawing to eliminate the possibility of a dry fire. No broadheads or practice broadheads shooting allowed. Arrow tips/points must be the same diameter as the diameter of the arrow shaft. Ensure arrow tips/points are not loose to prevent damage on targets. Anyone 16 and under must be under adult supervision. Verify that the range is clear. Give “Line is Hot” or similar command to indicate shooting may commence. 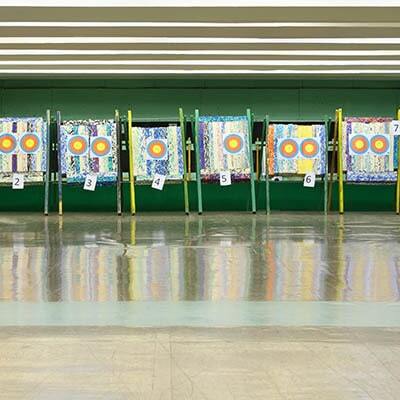 When finished shooting, set bow away from the line and wait behind the line until all archers are finished shooting. Give a “Pull” or similar command to indicate all shooting should stop. Verify all equipment is put down and remains behind the shooting line. Proceed to the targets to retrieve arrows. Inspect each arrow shaft, nock and other components for any damages before each shoot. Place the arrow between your thumb and fingers, and using your other hand slowly rotate the shaft, run your fingertips along the entire arrow length, feeling and looking closely for nicks, cracks, splits, dents, and other marks that could indicate the shaft is damaged. Perform the Flex Test on carbon arrows by grasping the shaft above the point and below the nock, then flex the arrow in an arc with deflection of 1-2 inches, then listen for cracking noises. Perform this test four to six times, rotating the arrow slightly between each flex until you have gone around the entire arrow. If cracking is heard, discard arrow. Additionally, while holding the point and fletching ends, twist the shaft in both directions. If the arrow “relaxes” or twists easily, discard the arrow.